Phoenix is a great city for hiking, if you have some common sense about heat exposure and keeping water on hand. There are many amazing mountain preserves throughout the city, one of the most famous of which is Camelback Mountain. What is less known to visitors is that the city is also ringed by several man-made lakes. Every one is unique, and they all offer a variety of outdoor activities. Canyon Lake is my favorite. And Boulder Canyon Trail is the best trail to get views of the lake, and surrounding mountains. Hike far enough, and you will also be able to see the Superstitions and Weaver’s Needle. Level of Difficulty: Moderate; rocky trail, with consistent inclines. 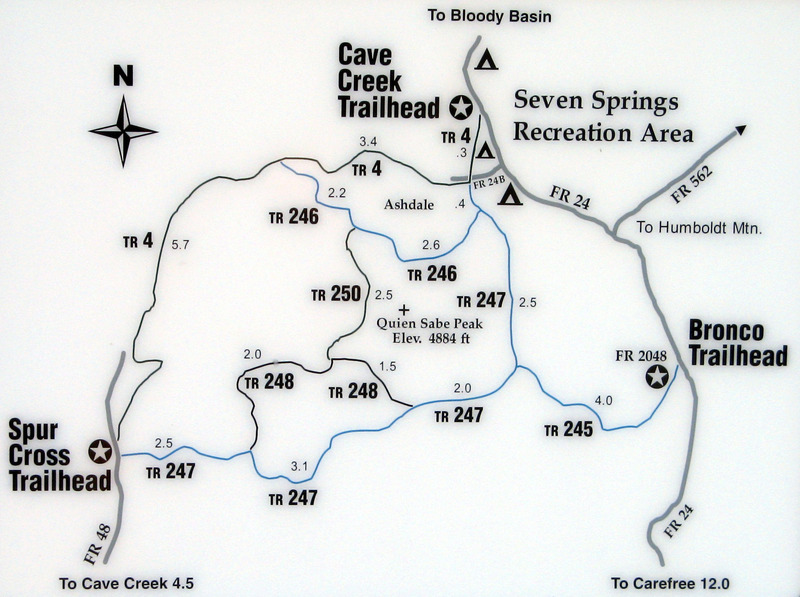 Easy to navigate within 3 miles of the trailhead. Accessible to…: All vehicle types; the road leading up to the trailhead is paved, although windy and narrow at some points. Suggested Route: Unless you are very experienced with desert hiking and navigation, I would suggest just doing 3 miles in and then another 3 miles out (or less; out and back). This is straightforward and will afford you some amazing views. This is not a loop trail, but it does connect to the network of Superstition trails. Trail Description: Boulder Canyon Trail starts across the 88 from the marina parking lot. You will be faced with an immediate junction, one trail to the left and one to the right. Follow the sign for Boulder Canyon to the left (if you go to the right, the trail is short and just follows the edge of the lake). Once you get started, you will have to deal with a steady climb up Frog Peak. This mountain is quite rounded, and more like a hill than anything else, but the trail is rocky and the climb is consistent. The plant and bird diversity is wonderful in this area, and even the rocks are little rainbows of lichen forests. When and if you find yourself puffing on the way up, be sure to pause and enjoy both the scenery and the unique ecosystem around you. At the top of Frog Peak you will get some very beautiful views of Canyon Lake. The dam, marina, and canyon that gives the lake its name will all make an appearance. The colorful mountains that encircle this area are breathtaking as well. Honestly, I just can’t say enough how much I love this area. It is the epitome of desert beauty. If you keep going past the cairn on the peak, the trail will wind you to the south along the mountains for a way. There are a few ups and downs here, but overall, nothing as strenuous as the trek up the first mountain. If you are feeling up to it, I highly suggest continuing on for a while. This is the part of Boulder Canyon Trail where you will get the best views of Weaver’s Needle, and you will have the opportunity to experience some of the lesser known mountain vistas in the area. After this stretch, the trail will dip down towards a creek bed. This is where I typically turn around, either at the top of the descent or at the bottom if I want more of a work out coming back up. You can keep going, but Boulder Canyon Trail is quite long and connects with other trails, so for casual hikers or visitors, I wouldn’t suggest it. Plus, if you turn around, you will have more time to stop by Tortilla Flats for Prickly Pear ice cream! For more info on the trail, read through Hike Arizona’s guide. And if you are looking for more ideas for things to do in Arizona, our guide to the state will help you find unique events, hikes, and restaurants to visit.